Evening Primroses and Sundrops are very similar in appearance. They both have lance-shaped leaves and an upright growth habit. They both bear large (~2-inch) yellow flowers, each with four petals and a large x-shaped stigma at the center. 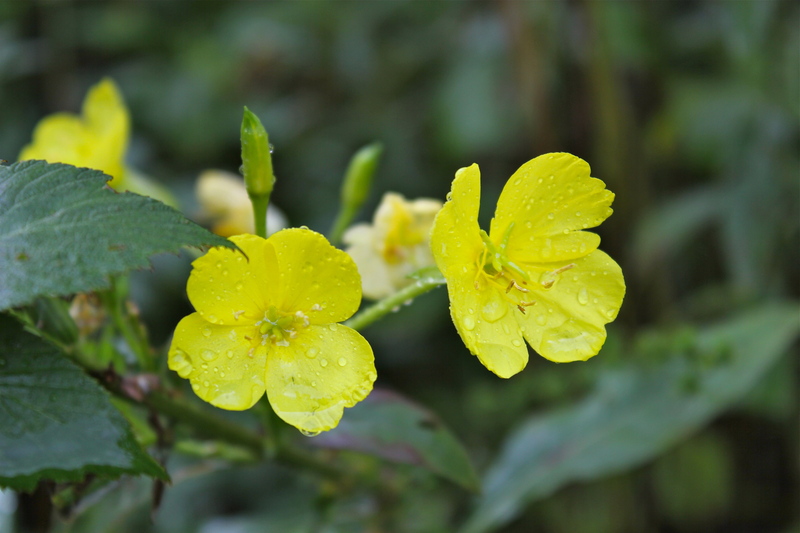 The flowers of Evening Primrose are mostly closed during the day but open toward evening (hence the name). The opposite is true of Sundrops. Their flowers open during the day. I have fond memories of growing Sundrops in my Mississippi garden in years past. It overwinters in the south as a low, basal rosette of evergreen leaves. In late spring, it grows tall again, up to 2 feet in height before coming into bloom. Then, spikes of sassy yellow flowers dependably light up the borders. This is a happy plant that’s commonly gifted from one gardener to another because it transplants so well. Bloom time in my part of Virginia is early August. The flowers will give way later to club-like, 4-angled fruit capsules (see gallery below).